This project is brought to you by the Data Science and Artificial Intelligence Division, GovTech Singapore. Have you ever looked at an old black and white photo and wondered: what did the person taking this photo actually see? Was there something about the arrangement of colours that compelled the photographer to capture this very moment? And if so, did the photographer see something that we — modern day viewers of this black and white photo — are not privy to? While it is impossible to replicate the exact conditions in which the original photo was taken, it is possible to add colour to the photo to help us imagine what the photographer could have seen in that instant. It is incredible — almost magical — how a little bit of colour can bring us that much closer to that specific moment in time. And as such, for our hackathon in January, our team decided to build a deep learning colouriser tool trained specifically for old Singaporean photos. An important note here: the point of colourisation is to generate an image with colours that are plausible. It by no means guarantees that the colourised image is an accurate representation of the actual snapshot in time. Another note: colourisation is a field of active research and our model is by no means perfect — it works well on some images but not others. If you have old black and white photos and would like to colourise them, you can do so here: “); background-size: 1px 1px; background-position: 0px calc(1em + 1px);”>Colourise.sg. We do not store any of the photos that you upload to our colouriser application. We are planning to run this service for the month of February — but might extend it depending on usage. We will explain how we created “); background-size: 1px 1px; background-position: 0px calc(1em + 1px);”>Colourise.sg in the following sections of this blog post. Skip ahead to the end if you would like to check out more of our results! Wait. Hasn’t this been done before? While it is true that colourisation tools exist, to our knowledge, none of these tools have been trained to colour images specific to the Singaporean historical context. Why does this matter, you ask? Take, for example, the black and white image from the beginning of the article and its colourised output created by the deep learning tool “); background-size: 1px 1px; background-position: 0px calc(1em + 1px);”>Algorithmia. Algorithmia produces an image that lacks colour intensity and is not very believable. Original image (left), output image colourised by Algorithmia (right). A major contributing factor to poor colourisation of old Singaporean photos could be the fact that the old Singaporean black and white images are too different from the training dataset. The model used by Algorithmia (created by “); background-size: 1px 1px; background-position: 0px calc(1em + 1px);”>Zhang et al) is trained using 1.3 million images from “); background-size: 1px 1px; background-position: 0px calc(1em + 1px);”>ImageNet — a commonly used image database created by researchers at Stanford University and Princeton University. And as such, ImageNet is unlikely to have images relevant to Singapore. What this means is that the model is unlikely to have learnt what the colours of an old Singaporean schoolyard scene could plausibly be. We hypothesise that a tool trained on Singapore-specific historical images will produce more believable colourised old Singaporean photos than existing tools. How does one colourise a black and white image? Before we jump into how colourisation can be done by a computer programme, let’s first consider how colourisation is done by a human colourist. (2) colour the black and white image using software tools like Photoshop. (2) colour the black and white image. We used the popular fast.ai and PyTorch libraries to develop our model, with an architecture and training steps inspired by Jason Antic ( “); background-size: 1px 1px; background-position: 0px calc(1em + 1px);”>https://github.com/jantic/DeOldify). We trained our model based on a new set of more than 500,000 old, publicly available Singapore based images that we compiled, using a local GPU cluster with NVIDIA V100 GPUs. Other steps we took to improve our model included adding images from Google’s Open Images V4, especially for body parts that our model did not seem to do too well on (e.g. hands, legs, and arms which were hard for the model to identify), and modifying learning rates and batch sizes for better results. At this point, our deep learning model lived in our office’s local GPU cluster — which meant that only our team had access to the colouriser model. In order for the colouriser to be useful to anyone outside our team, we had to deploy it on the internet. (4) backend colouriser services with NVIDIA Tesla K80 GPUs that perform the actual colourisation. The colourisation step is compute intensive and takes approximately 3 seconds to complete per image. As such, we decided to shield the backend colouriser services by using an NGINX server to queue requests to the backend. If the rate of incoming requests far exceeds the rate that our backend services can handle, the NGINX server immediately returns a status response to the client asking the user to try again later. The key highlight of this architecture is that the colouriser service virtual machines (VMs) are autoscaled in response to how much traffic each VM has to service. This saves on cost because additional VMs are only switched on when there is demand for it. Here are some of our favourite results using photos obtained with permission from the New York Public Library and the National Archives of Singapore. We would like to note that our sources only provided us with the black and white photos and are not in any way responsible for the colourised output created by us. Our model performs well on high resolution images that prominently feature human subjects (images where people occupy a large portion of the image) and natural scenery. The following images look believable (at least to us) because they contain objects that exist in sufficient examples of the training image dataset. And so the model is able to identify the correct objects in the image and colour them believably. 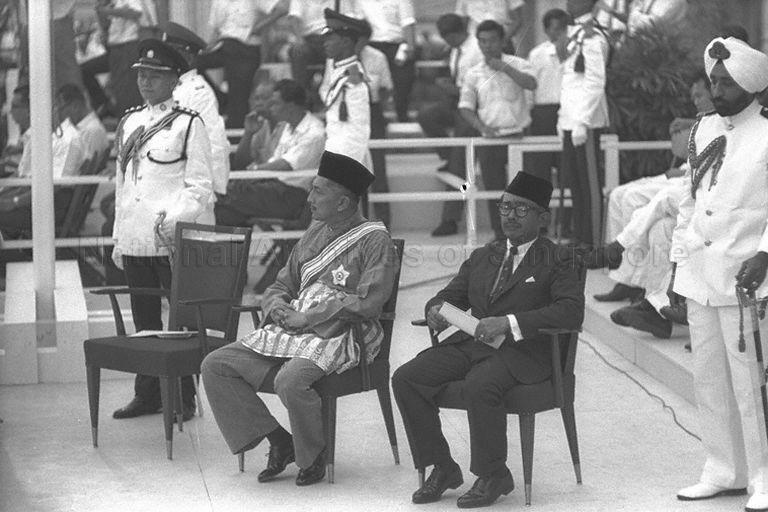 “); background-size: 1px 1px; background-position: 0px calc(1em + 1px);”>“Malaysia Day Celebrations at Padang” — Yang Di-Pertuan Negara Yusof Ishak and Federation’s Internal Minister for Security Dato Dr Ismail bin Dato Abdul Rahman. 16 September 1963. The National Archives of Singapore (left), colourised photo by Colourise.sg (right). 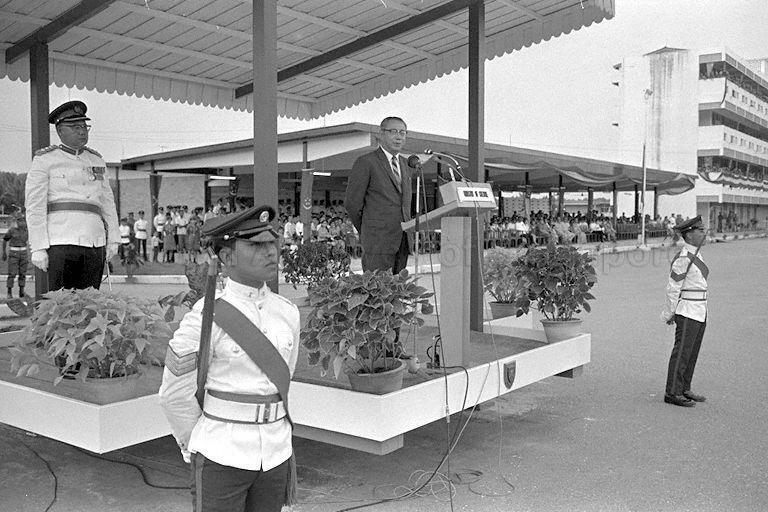 “); background-size: 1px 1px; background-position: 0px calc(1em + 1px);”>“Minister for the Interior and Defence Lim Kim San speaking at Passing Out Parade of officer cadets at Pasir Laba Camp in Jurong”. 10 July 1969. The National Archives of Singapore (left), colourised photo by Colourise.sg (right). “); background-size: 1px 1px; background-position: 0px calc(1em + 1px);”>“Connaught Drive, Singapore.” “); background-size: 1px 1px; background-position: 0px calc(1em + 1px);”> “); background-size: 1px 1px; background-position: 0px calc(1em + 1px);”>The New York Public Library Digital Collections “); background-size: 1px 1px; background-position: 0px calc(1em + 1px);”>. The Miriam and Ira D. Wallach Division of Art, Prints and Photographs: Picture Collection, The New York Public Library “); background-size: 1px 1px; background-position: 0px calc(1em + 1px);”> “); background-size: 1px 1px; background-position: 0px calc(1em + 1px);”>(left), colourised photo by Colourise.sg (right). “); background-size: 1px 1px; background-position: 0px calc(1em + 1px);”>“Singapore.” “); background-size: 1px 1px; background-position: 0px calc(1em + 1px);”> “); background-size: 1px 1px; background-position: 0px calc(1em + 1px);”>The New York Public Library Digital Collections “); background-size: 1px 1px; background-position: 0px calc(1em + 1px);”>. The Miriam and Ira D. Wallach Division of Art, Prints and Photographs: Picture Collection, The New York Public Library “); background-size: 1px 1px; background-position: 0px calc(1em + 1px);”>(left), colourised photo by Colourise.sg (right). Funky things happen when the model does not recognise objects in the photo. Take for example the following image, “Japanese Surrender at Singapore”. The colouriser colours one — and only one — of the soldiers’ fist red. But it gets the rest of the soldiers’ fists correct. This happens because the model is unable to tell that the clenched fist is actually a fist from the angle the photo was taken. And so the colouriser makes its best guess but didn’t quite get it right. “); background-size: 1px 1px; background-position: 0px calc(1em + 1px);”>“Japanese Surrender at Singapore”. 12 September 1945. Royal Navy official photographer — Trusler C (Lt). Imperial War Museums “); background-size: 1px 1px; background-position: 0px calc(1em + 1px);”> “); background-size: 1px 1px; background-position: 0px calc(1em + 1px);”>(left), colourised photo by Colourise.sg (right). 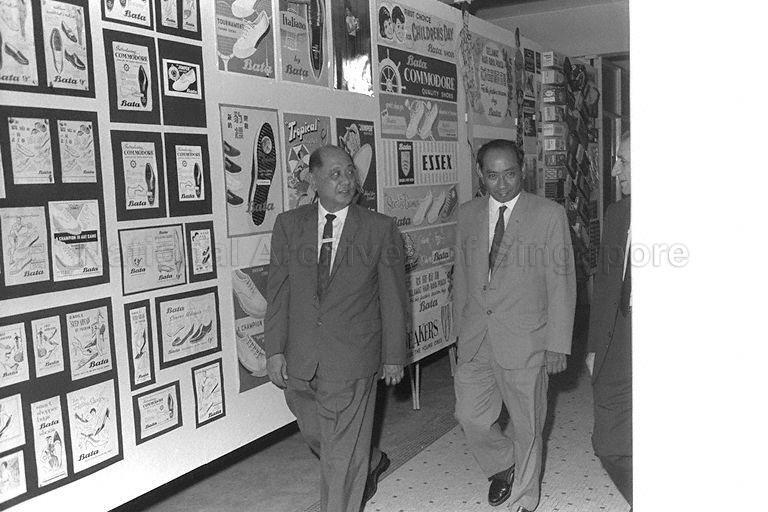 This happens again in the following image, “Minister of Finance Dr. Goh Keng Swee arrives at opening of Bata shoe factor in Telok Blangah”. The face of the man on the right of the photo is coloured a ghastly grey because half of the man’s face is hidden from view, and so the model is unable to identify the object in the photo. This phenomenon is known as occlusion — one of the major challenges in computer vision, where object recognition algorithms have trouble identifying objects that are partially covered. “); background-size: 1px 1px; background-position: 0px calc(1em + 1px);”>“Minister of Finance Dr. Goh Keng Swee arrives at opening of Bata shoe factory in Telok Blangah”. 09 April 1964. The National Archives of Singapore “); background-size: 1px 1px; background-position: 0px calc(1em + 1px);”>(left), colourised photo by Colourise.sg (right). Here are more cool results from the colouriser. Because, why not? “); background-size: 1px 1px; background-position: 0px calc(1em + 1px);”>“Malay girl, Singapore”. Date unknown. “); background-size: 1px 1px; background-position: 0px calc(1em + 1px);”> “); background-size: 1px 1px; background-position: 0px calc(1em + 1px);”>The New York Public Library Digital Collections. “); background-size: 1px 1px; background-position: 0px calc(1em + 1px);”>The Miriam and Ira D. Wallach Division of Art, Prints and Photographs: Picture Collection, The New York Public Library (left), colourised photo by Colourise.sg (right). “); background-size: 1px 1px; background-position: 0px calc(1em + 1px);”>“Singapore”. Date unknown. “); background-size: 1px 1px; background-position: 0px calc(1em + 1px);”> “); background-size: 1px 1px; background-position: 0px calc(1em + 1px);”>The New York Public Library Digital Collections. “); background-size: 1px 1px; background-position: 0px calc(1em + 1px);”> “); background-size: 1px 1px; background-position: 0px calc(1em + 1px);”>The Miriam and Ira D. Wallach Division of Art, Prints and Photographs: Picture Collection, The New York Public Library (left), colourised photo by Colourise.sg (right). “); background-size: 1px 1px; background-position: 0px calc(1em + 1px);”>“Cattle grazing amid piles of coconut shells, Singapore.” “); background-size: 1px 1px; background-position: 0px calc(1em + 1px);”> “); background-size: 1px 1px; background-position: 0px calc(1em + 1px);”>The New York Public Library Digital Collections “); background-size: 1px 1px; background-position: 0px calc(1em + 1px);”>. The Miriam and Ira D. Wallach Division of Art, Prints and Photographs: Picture Collection, The New York Public Library “); background-size: 1px 1px; background-position: 0px calc(1em + 1px);”> “); background-size: 1px 1px; background-position: 0px calc(1em + 1px);”>(left), colourised photo by Colourise.sg (right). “); background-size: 1px 1px; background-position: 0px calc(1em + 1px);”>“Malay woman, Singapore.” “); background-size: 1px 1px; background-position: 0px calc(1em + 1px);”> “); background-size: 1px 1px; background-position: 0px calc(1em + 1px);”>The New York Public Library Digital Collections “); background-size: 1px 1px; background-position: 0px calc(1em + 1px);”>. The Miriam and Ira D. Wallach Division of Art, Prints and Photographs: Picture Collection, The New York Public Library “); background-size: 1px 1px; background-position: 0px calc(1em + 1px);”> “); background-size: 1px 1px; background-position: 0px calc(1em + 1px);”>(left), colourised photo by Colourise.sg (right). “); background-size: 1px 1px; background-position: 0px calc(1em + 1px);”>“Adelphi Hotel Singapore.” “); background-size: 1px 1px; background-position: 0px calc(1em + 1px);”> “); background-size: 1px 1px; background-position: 0px calc(1em + 1px);”>The New York Public Library Digital Collections “); background-size: 1px 1px; background-position: 0px calc(1em + 1px);”>. 1926. The Miriam and Ira D. Wallach Division of Art, Prints and Photographs: Picture Collection, The New York Public Library “); background-size: 1px 1px; background-position: 0px calc(1em + 1px);”> “); background-size: 1px 1px; background-position: 0px calc(1em + 1px);”>(left), colourised photo by Colourise.sg (right). “); background-size: 1px 1px; background-position: 0px calc(1em + 1px);”>“Jiksha Station, Singapore.” “); background-size: 1px 1px; background-position: 0px calc(1em + 1px);”> “); background-size: 1px 1px; background-position: 0px calc(1em + 1px);”>The New York Public Library Digital Collections “); background-size: 1px 1px; background-position: 0px calc(1em + 1px);”>. The Miriam and Ira D. Wallach Division of Art, Prints and Photographs: Picture Collection, The New York Public Library “); background-size: 1px 1px; background-position: 0px calc(1em + 1px);”> “); background-size: 1px 1px; background-position: 0px calc(1em + 1px);”>(left), colourised photo by Colourise.sg (right). “); background-size: 1px 1px; background-position: 0px calc(1em + 1px);”>“Queen’s Place, Singapore.” “); background-size: 1px 1px; background-position: 0px calc(1em + 1px);”> “); background-size: 1px 1px; background-position: 0px calc(1em + 1px);”>The New York Public Library Digital Collections “); background-size: 1px 1px; background-position: 0px calc(1em + 1px);”>. The Miriam and Ira D. Wallach Division of Art, Prints and Photographs: Picture Collection, The New York Public Library “); background-size: 1px 1px; background-position: 0px calc(1em + 1px);”> “); background-size: 1px 1px; background-position: 0px calc(1em + 1px);”>(left), colourised photo by Colourise.sg (right). “); background-size: 1px 1px; background-position: 0px calc(1em + 1px);”>“Anderson Bridge, Singapore.” “); background-size: 1px 1px; background-position: 0px calc(1em + 1px);”> “); background-size: 1px 1px; background-position: 0px calc(1em + 1px);”>The New York Public Library Digital Collections “); background-size: 1px 1px; background-position: 0px calc(1em + 1px);”>. The Miriam and Ira D. Wallach Division of Art, Prints and Photographs: Picture Collection, The New York Public Library (left), colourised photo by Colourise.sg (right).